Move quick, light, and self-supported while following rarely used trails on the circuit. 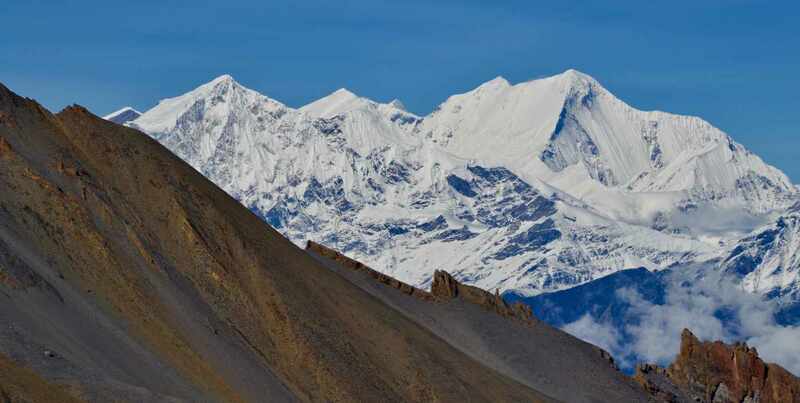 This is the perfect introduction to high altitude mountain running in Nepal. We are experts on alternative trails around the circuit. Ten and a half days on trail with two acclimatization days. Distance: 228k/142.6miles, Total Gain: 11,846m/38,863ft, Total Loss: 11,282m/37,013ft, Max Elevation: 5,405m/17,728ft. Choose your flavor for the Annapurna Circuit! Each trip limited to 10 qualified participants. Briefing and Orientation starting at noon. Day 1 Kathmandu to Besisahar (760m) Bus Transport. I loved this. It was a big highlight of the summer. Would highly recommend next year’s trip if you’re looking for something beautiful, fun, challenging and unique. Do it! You won’t regret it for a moment. The trail, the people, the camaraderie are all 1st rate. The best trip for your money, hands down! This was a life dream trip of mine and this was exactly how I wanted to do it. Check it out if you’ve ever felt the pull to explore Nepal! I highly recommend doing this!! It’s such an amazing experience and the people putting it on make it that much better! The loving culture, food and people make Nepal that much more beautiful! Sign up!! Just do it! You won’t regret it!! Promise!